Your wedding reception is a formal affair. Proper etiquette and good table manners calls for the host to ensure the table has been set correctly. The place settings should reflect the menu choices and always be positioned correctly. Don't leave anything to chance. It is best to consult with your catering manager to be sure everything will be set properly. 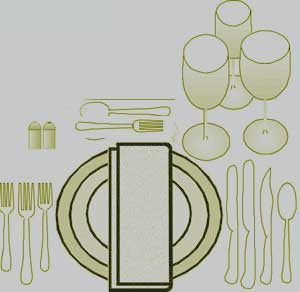 There are three types of place settings: Formal, Informal and Basic with two common rules shared. 1. The utensils are placed in the order of use from the outside in. Forks are place to your left. Knives and spoons are placed to your right. The Elements of the Formal Place Setting are not complicated. There are many elements, yet each is used in the order of service. Once you visualize where each element is placed and see how each is used during the meal, you will appreciate the fine art and nuance of a formal dinner setting. are generally unsightly. As they are important to the meal, consideration should be given to them as part of the table decor. THE CHARGER PLATE is an oversized and decorative plate set in place for each guest. The use of a Charger is highly recommended as it presents a lovely and complete look to your table before the food has been served. Once the food course begins, it will remain in position. The plate for each food course will be placed on top of the Charger and removed, leaving the Charger to decorate the table between courses. THE CHINA selection can be used as an added element of décor to your table setting. Choose a pattern that enhances your charger plate and that beautifully accents your table lines. Your dining china is made up of 3 main elements: Bread or Butter, salad and dinner plates. THE NAPKIN is placed on top of the charger plate. In the absence of a Charger, the Napkin is placed in the empty space where the dinner plate will be placed. Although the napkin placement does not change you do have a choice on how to present it. You may choose the fabric and color of the napkin as well as the napkin fold. Your napkin is also a great location to insert your menu card. THE BREAD & BUTTER PLATE is placed above the forks on the left with the butter knife placed diagonally on top of the plate. Place the handle facing the right and blade faced down. THE SALAD PLATE is a smaller than your dinner plate and, when served, is placed on top of your charger plate. THE DINNER PLATE for the main entree will be placed on top of your charger plate. 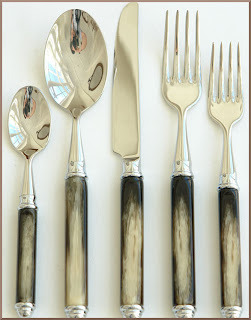 THE FLATWARE selection is equally important as a decorative element. You may select a elegant sterling silver pattern that will blend in nicely with your tabletop décor or a more eccentric pattern with gold accents and engraving for more of a statement. No rules apply to selecting flatware other than making sure that you include the appropriate elements that will be used for your menu selections. THE DINNER FORK is the largest of the forks and is placed to the left edge of the charger plate. THE SALAD FORK is placed to the left of the dinner fork. Should your menu require your salad to be served after the entrée the small salad fork is placed to the right of the dinner fork, next to the charger. THE FISH FORK is placed farthest to the left of the dinner fork because it is the first fork used. Only set a fish fork if fish is to be served. THE DINNER KNIFE is placed to the right edge of the charger plate. THE FISH KNIFE is a specially shaped knife placed to the right of the dinner knife. THE SALAD KNIFE is included if the salad is to be served first and is placed to the right of the fish knife. SOUP SPOON is placed to the right of the knives if soup is to be served as a first course. OYSTER-COCKTAIL FORK is set to the right of the spoons if shellfish is being served. Please note: this is the only fork ever placed on the right of the plate and although very cute, in an effort not to confuse your guests, please do not place them on the table if you are not serving a fish or seafood course. GLASSWARE is placed to the upper right of your dinner plate and can number up to five depending on your beverage service. It is a very important element on your table top. It enhances the mark you are placing on your table décor. As with your china pattern you may select from a variety of glassware to accompany your place setting. 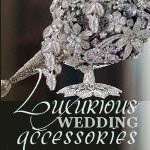 Your pattern selection may consist of clear crystal, colored glassware or an elaborate pattern. THE WATER GOBLET is placed directly above the knives. THE CHAMPAGNE FLUTE is placed to the right of the water goblet. THE WINE GLASSES are set slightly below and to the right of your water goblet. THE SHERRY GLASS is placed to the right of the red and white wine glasses. Depending on how much room you have on your dining table, you dessert spoon or fork and coffee spoon may be brought to the table along with the dessert and coffee or placed horizontally at the top of the dinner plate. In the latter scenario, your coffee spoon is placed closest to the top of the dinner plate followed by the dessert spoon on top of the coffee spoon. In this scenario, both spoon handles should be pointing toward your right. Should your dessert require a fork, the dessert fork is placed on top of the coffee spoon with the tines pointing to the right, handle to the left. COFFEE is served butler style with the coffee spoon on the saucer to the right of the handle. You may also elect to have the coffee spoon incorporated into your flatware presentation and is placed closest to the top of the charger plate. Your coffee cup and saucer will be in the same pattern as the china chosen for dinning. The design of the table is a major visual factor when guests enter the reception room. A beautiful table has harmony and balance. The centerpiece is the anchor of the design and the place settings must be positioned at an equal distance from each other and from the centerpiece. 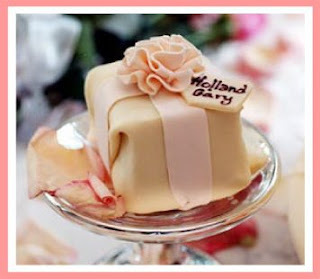 Individual Wedding Cake Desserts Elegant Cheese Cakes. Glassware by Vera Wang. Napkins by Wildflowers. Flateware by Carolyne Roehm.